The latest update to the Oxford Dictionary of National Biography—published on Thursday 6 October 2016—adds biographies of 89 men and women active over 500 years of British history. October’s update includes an entry on the artist Tirzah Garwood (1908-1951), who was married to Eric Ravilious, who becomes the 60,000th person to be added to Dictionary. The October update also adds 35 biographies of early nineteenth-century slave-owners, who were recipients of compensation from the Commissioners of Slave Compensation after the passing of the Abolition Act in 1833. These biographies have been researched and written in collaboration with the new Centre for the Study of the Legacies of British Slave-ownership at University College London. New figures include John Stewart (1789-1860), a slave owner in Berbice, who was probably of African descent. As an MP, Stewart represented the concerns of the West India interest while establishing business interests in the City of London: he is thought to have been the first MP of black or mixed race. The October update also adds 40 biographies of men and women associated with the city of Hull, which is UK City of Culture, 2017. Among those now added to the Dictionary are Ethel Leginska (1886-1970)—who was born in Hull, and became a noted composer and the first woman to conduct some of the world’s leading orchestras—and Jean Hartley (1933-2011) who published The Less Deceived—the first volume of poems by Philip Larkin, following the poet’s arrival in Hull. 2000 gallery pages in Art UK, allowing readers to view art works in public collections by artists with entries in the ODNB. 150 links to financial records of former slave-owners via the Legacies of British Slave-ownership project, at University College London. 150 monuments of the Commonwealth War Graves Commission, for servicemen and women killed during the First and Second World Wars. 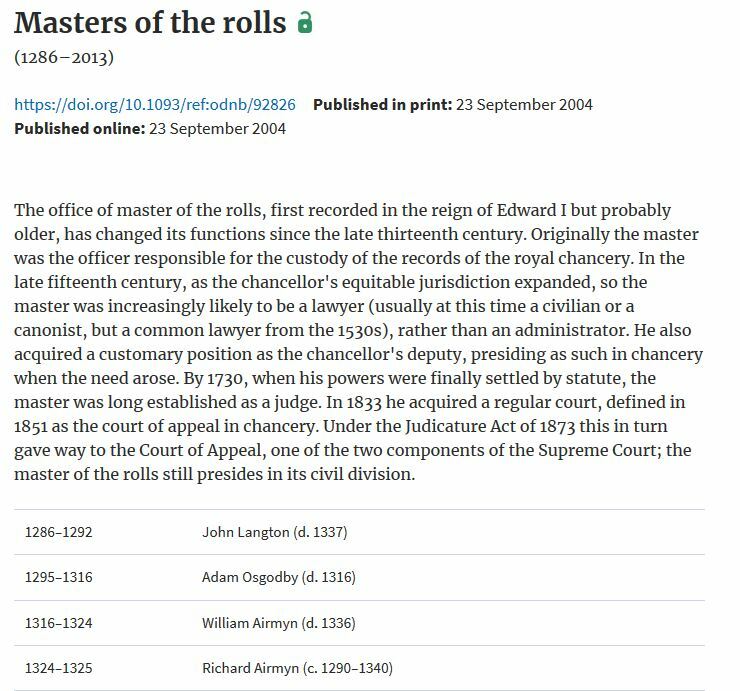 100 links to resources at the Institute of Historical Research, London, including historians’ records in Making History, and biographical content in British History Online. Highlights from the new edition are available here. The Oxford DNB is the national record of 60,000 men and women who’ve shaped all walks of British life, worldwide, from the Roman occupation to the 21st century. A research and publishing project of the History Faculty and OUP, the ODNB online is available via SOLO. The latest update to the Oxford Dictionary of National Biography—published on Thursday 26 May 2016—adds biographies of 93 men and women active over 4000 years of British history. May’s update provides a special focus on eighteenth and nineteenth-century women entrepreneurs, inventors, and industrialists. New additions include the Bristol inventor, Sarah Guppy (1770-1852), whose many patents include designs for a suspension bridge crossing the River Avon—years before Telford and Brunel. Sarah Guppy’s inclusion in the Oxford DNB has featured in articles for The Times and Daily Telegraph and on BBC Radio 4’s Today programme (30 May). Early modern religious biographies include Anne Hooper (d. 1555), one of the earliest wives of a bishop in the post-Reformation period. Hooper’s letters chart a period of intense religious and personal uncertainty. Contributions from members of the Oxford History Faculty include Felicity Heal on the Tudor diarist Richard Stonley (1520/21-1600), the first person known to have purchased a work by William Shakespeare (in 1593), and William Whyte on the architect, Daniel Robertson (c.1770–1849), who designed the Oxford University Press building in Jericho. The earliest new addition is Racton Man (fl. c.2200 BP), the skeleton of a Bronze Age warrior at The Novium Museum, Chichester, whose ‘biography’—based on forensic science—can now be written. May’s update also includes two pioneers of tattooing: George Burchett (1872-1953) and Sutherland Macdonald (1860-1942). Macdonald coined the term ‘tattooist’ (‘tattoo’ + ‘artist’) to better convey the artistry of his work, and both men numbered members of the aristocracy and royalty among their clients. The new edition also extends the ODNB’s coverage of historical groups and networks. Essays include the Pre-Raphaelite Brotherhood; the Erasmus Circle of scholars who championed the great Dutch humanist from the early 1500s; and participants in the Northern Rising (1569-70). Essays on more than 320 historical groups—early medieval to late modern—are now available in the ‘Themes’ area of the Oxford DNB online. Finally, 4000 new links have been added from ODNB entries to online resources providing alternative perspectives on an individual. These include links to 850 English Heritage Blue Plaques, 650 monuments in Westminster Abbey, 200 person records in Queen Victoria’s Journals, 200 Poetry Archive and BBC recordings, and 2500 correspondence records created by Oxford History research project, ‘Early Modern Letters Online’. Highlights from the new edition are available here. The Oxford DNB is the national record of 60,000 men and women who’ve shaped all walks of British life, worldwide, from the Roman occupation to the 21st century. It’s a research and publishing project of the History Faculty and OUP and available via SOLO. 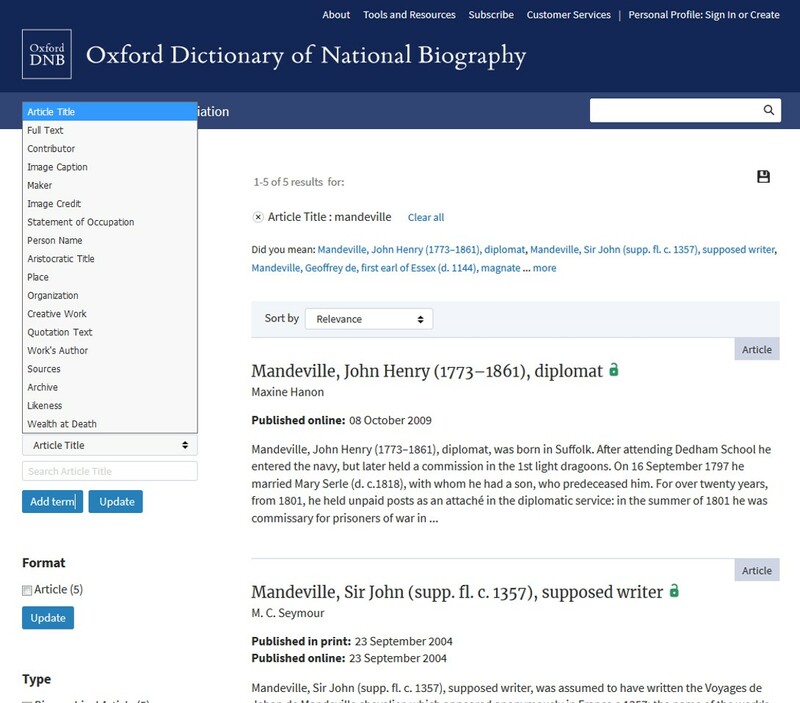 The Oxford Dictionary of National Biography is offering three research bursaries of £750 each to promote the ODNB online as a source for new research in the humanities. The research bursaries are intended, via a defined research project, to promote further imaginative study of the Dictionary’s content to our understanding of the British history and culture. One of the bursaries will be awarded in association with the Oxford Centre for Life Writing (OCLW) at Wolfson College, Oxford. The OCLW / ODNB bursary is for a research project in the fields of English, Music, Art or Philosophy. The bursaries are open to PhD students or post-holders at Higher Education Institutions in the UK or overseas; or an individual undertaking scholarly research in the humanities—for example, as an archivist, librarian, museum curator, or in a private capacity without such an affiliation. The closing date for application is Sunday 12 June 2016. Further details and an application form are available here. 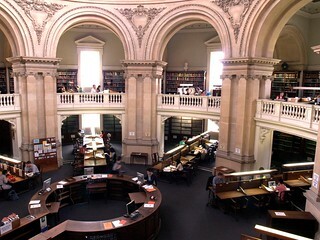 The Oxford DNB is the national record of 60,000 men and women who shaped British history and culture—in the British Isles and overseas—from the Roman period to the year 2012. The Dictionary is a research and publishing project of the University of Oxford’s History Faculty and Oxford University Press, with a staff of academic editors and publishers. 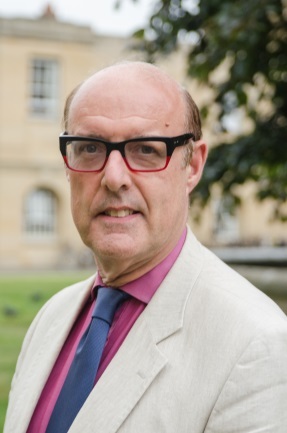 The ODNB’s General Editor is the historian, Professor Sir David Cannadine. The latest update to the Oxford Dictionary of National Biography—published on Thursday 7 January 2016—adds biographies of 222 modern Britons who died in the year 2012. 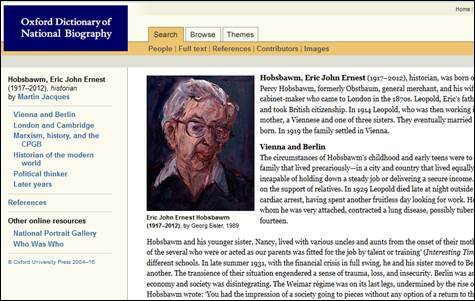 The update includes the historian and political commentator, Eric Hobsbawm (1917-2012), whose ODNB biography is written by Professor Martin Jacques. 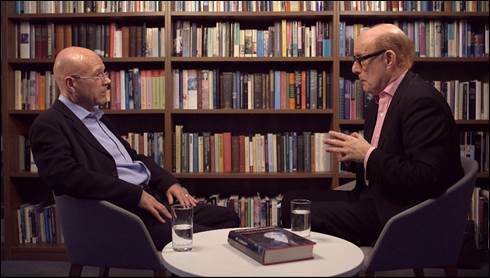 The update is accompanied by a short film in which Martin discusses Hobsbawm’s life and work with the Oxford DNB’s general editor, Professor Sir David Cannadine. A longer audio version of the full discussion is available via SoundCloud. Other notable figures, now added to the Oxford DNB, include war correspondent Marie Colvin (1956-2012) who was killed in Syria; editor of the Times, William Rees-Mogg (1928-2012); photojournalist Eve Arnold (1912-2012), the astronomers Sir Patrick Moore (1923-2012) and Sir Bernard Lovell (1913-2012); hairdresser Vidal Sassoon (1928-2012); Jim Marshall (1923-2012), inventor of the Marshall amp; Allan Horsfall (1927-2012), pioneer of gay rights in Britain; Sir Rex Hunt (1926-2012), governor of the Falkland Islands during the 1982 conflict, and Gerry Anderson (1929-2012), animator and creator of the children’s puppet series, Thunderbirds. The latest edition of the Oxford Dictionary of National Biography adds 100 biographies of men and women active between the early 13th and late 20th centuries, including Alma Taylor, Robert Stephenson, Margaret Clement and Alonso Cárdenas. The new update (published on 29 May) incorporates a special focus on a century of British cinema – from the silent stars of the 1910s to the actors, directors, and producers of later 20th Century films such as Get Carter and Carry On. The update also includes new biographies of 20 early modern nuns who, in the wake of the Reformation, founded or entered ‘English convents in exile’ in continental Europe and North America. Other new biographies include Charles Miller (1874-1953), ‘bringer of football to Brazil’ and Cuthbert Ottaway (1850-1878), recently in the news as the first captain of the England national football team, but better known in his lifetime as an Oxford University cricketer. There’s also the unusual and remarkable story of the medieval anchoress Christina Carpenter (fl.1329-1332) who was twice enclosed in a cell. 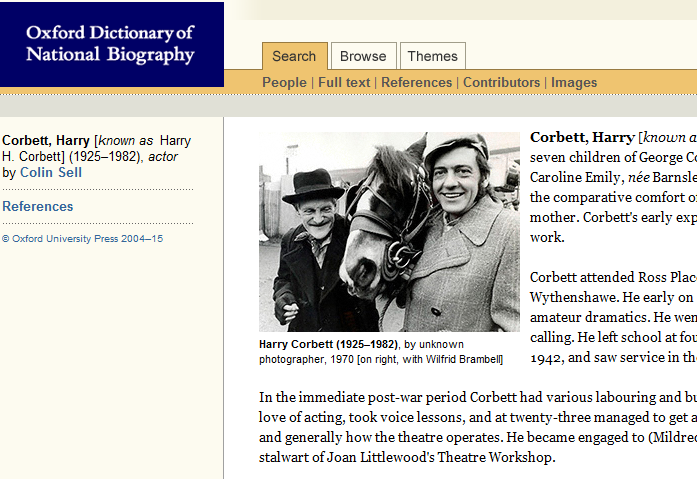 Highlights of the new edition are available to browse, together with an interactive timeline of the ODNB’s history of British cinema. 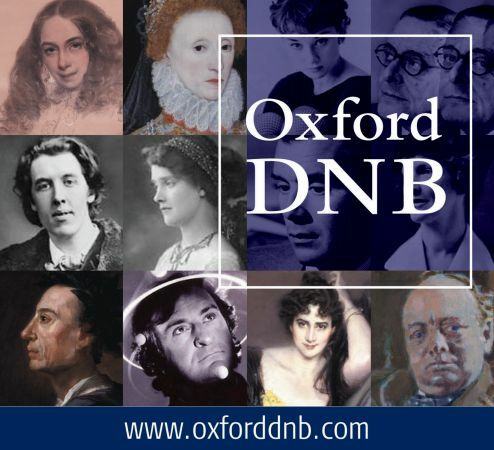 The ODNB also offers a free, twice monthly biography podcast, with over 200 life stories now available. 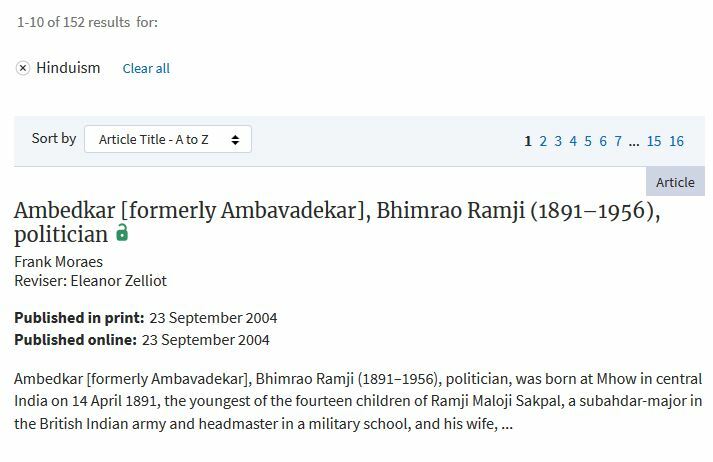 Readers can access the Oxford Dictionary of National Biography via SOLO and OxLIP+.